I remember having this conversation with my daughter as her dad arrived home from work one evening. Me : Honey, what do you do when you see daddy? Me : You have to say hi Daddy, and give him a hug. You have to honor daddy. Me : Ummm…honor is when you show respect to daddy. Me : It’s when you show daddy that he’s important to you. Me : Maybe you should just go and say hi to daddy and give him a hug. This happened when my eldest daughter was about three or four. I suppose it would have been easier for me to just tell my child to just go hug dad in the first place, rather than explain it with more words especially since it is defined as a “feeling”. How could I teach my daughter how to feel respect anyways, unless I could validate what she felt in her heart? In one of the parenting talks we’ve attended, we were taught to praise a child for a specific virtue instead of just saying “good job”. I’ve been guilty of overpraising my kids when they were young, and we were guilty of overusing these very two words. When my kids were younger, I would say “good job” and applaud them a lot when they identified things correctly or achieved a milestone. As they grew older, much to my distress, both my girls became hesitant in trying out new things for the fear of making a mistake. When they tried new things and met it with difficulty, they would stop and refuse to pursue it any further. There’s such a thing as too much praise. I thought I was doing the right thing by being encouraging, I didn’t know that it was creating a fear of failure, because they didn’t want to do anything less than a “good job” at such a young age. Today, at the school my kids go to, they have a merit system in the form of slips. They get pink slips when they achieve excellence in academics, or when they display character that is aligned with godly principles and good behavior. On the other hand, they receive blue slips for missed homework and materials. Blue slips can also serve as a warning for undesirable behavior. Just two weeks from when school started, one of my daughters was complaining about a classmate who was constantly borrowing one of her things, while she continued to lend it because her classmate promised to give it back the next time, her classmate would give her a difficult time every time she asked for the thing back. It resulted in her classmate breaking the borrowed item, which upset her. She was telling us about this incident over dinner. My husband wanted me to inform the teacher about the incident, and possibly have her re-seated to avoid any future conflict. I told him that I wanted to give her a chance to handle it on her own, as there would be no shortage of these incidents in the real world, she might as well deal with it in a controlled environment. The following week, my daughter got a pink slip for self-control. I didn’t ask the teacher why, but I guessed that it probably had something to do with how she reacted to that particular classmate. I asked her why she received a pink slip for self-control, and she simply told me that her teacher said she was well behaved. She never mentioned that it had anything to do with the earlier incident, but I wanted her to understand self-control more and why it’s important. I was happy that the school was teaching them to recognize this virtue, so I decided to help along at home by putting together what I learned from the seminar and from her school. If you understand the power of the tongue, you know that as a parent you can either bless or curse your child, because what you tell them can be a self-fulfilling prophecy. Putting down the list gives us the opportunity to bless our children more and help them pray about curbing the opposite traits. 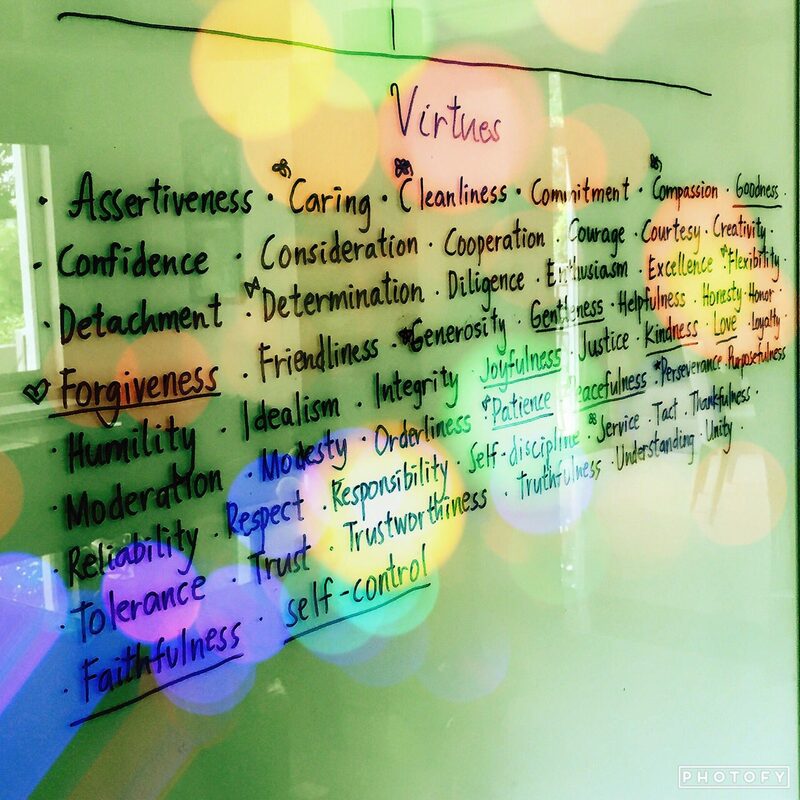 I put down a list of virtues in our study so we could remember to call it out when we see it, and because each child is unique, I put more weight in some virtues more than others, so that they could be more aware of the areas they needed to work on. Jia finds it easy to be orderly and clean, while Catie is constantly being reminded of the same. Catie finds it easier to be assertive and flexible, while Jia needs to grow more in that area. Relating the virtue to a certain action that they have personally accomplished in the past allows them to refer back to the same action and emotion received for that particular virtue. It trains them to react to a situation in the same positive way until it becomes a good habit. It then starts to become a conscious choice to want to display these virtues and thereby learning from their own actions. While I write this, I think it’s important to note that this is just a habit-forming exercise, it’s not just about promoting positive values, because even as parents, we continue to struggle with these very same virtues everyday. 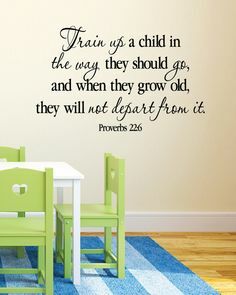 We don’t want to raise kids that simply display good behavior that don’t stem from a deep trust in God either, else this produces obedient kids from the wrong reasons. Romans 7:18 Apart from Jesus, nothing good dwells in them. I can get impatient or unkind when I’m busy with work and the children are uncooperative or rowdy. It’s not easy, especially when you’re dealing with a lot of deadlines. With everything that’s going on around us, it’s more difficult to live by these virtues as adults, but we need to remind ourselves to constantly model the same behavior that’s being taught to them. So it also keeps us on our guard. At the end of the day, it’s simply a tool that serves as a good reminder for all of us, not just our children. We want our children to seek God in order to correct bad habits from repeated sins through prayer, as we continue to rely on God’s grace to raise our children as He intended, that we may be able to become good stewards of the gifts he has given us. If you’re wondering about what happens to the points. I will be writing about that in another post. Wow! I love this! What a beautiful idea! I want to replicate it in my own home with my son. Thank you so much for sharing! This was brilliant.